At age 79, Lloyd Worthington is still turning out boats. 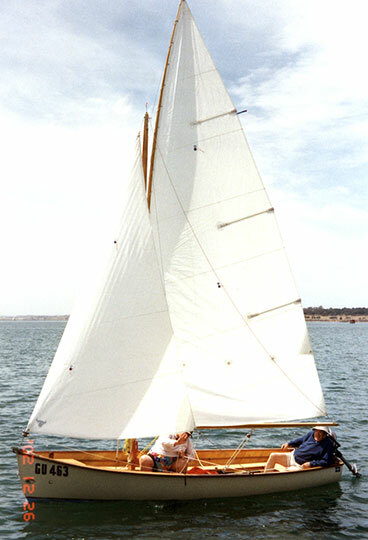 THE CELT is a Iain Oughtred Fulmar design, 16'8" x 5'10", that Lloyd built using cold-molded methods. He used hoop pine Australian marine plywood over red Meranti frames and stringers, then covered the hull with Bote-Cote marine epoxy. Lloyd spent two years building THE CELT and launched it on Corio Bay on March 22, 1001. He writes that she sails beautifully and that the rig is easy for single-handing. Lloyd has also built a cold-molded trailer-sailer and an 8' dinghy for his grandson, Scott.